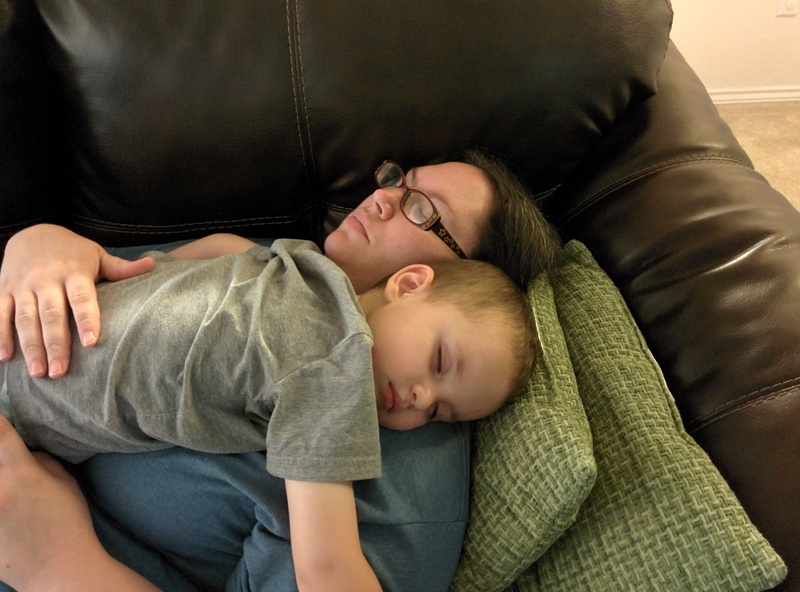 Weekly Happenings: We ended up spending most of the week at home because Joseph was not feeling well. It started the day we went out to the gulf (though we didn’t realize it then) and kind of lingered throughout the week. His symptoms were so varied that we had a hard time figuring out just what was wrong, so finally on Friday I took him in to the doctor’s. Turns out the poor little guy has strep throat. 🙁 We got started with the antibiotics and he’s now on the mend. The Weekly Weather: The weather has been interesting as of late. We’ve had a few thunderstorms and even were put on a tornado watch (tornadoes are very rare down here, so when they actually go through the trouble of warning us, it’s taken very seriously). Luckily, nothing actually happened in our area. Later we heard that a small tornado had touched down in the county that’s just southeast of us, but all it did was damage a barn; no people or livestock were injured. Since then, the weather has settled into the normal warm, humid summer weather that we’ve grown accustomed to. What Paul’s Been Up To: Paul has been a really big help while Joseph’s been sick. He’s picked up the stuff I’ve had to leave at the wayside (like going to clean the church on our assigned Saturday solo since I needed to stay home with Joseph). He also has been continuing to work hard keeping our yards looking really nice (which is pretty hard during a San Antonio summer) and even had time to put up a second ceiling fan (this time in our living room). What Sarah’s Been Up To: I ended up cancelling most of my piano lessons this past week due to the holiday and Joseph being sick. I love the versatility of being able to do that. Not having a boss to answer to is really nice. Other than that, I’ve been hanging out with Joseph because when he’s not feeling well, he seems to only want Momma. 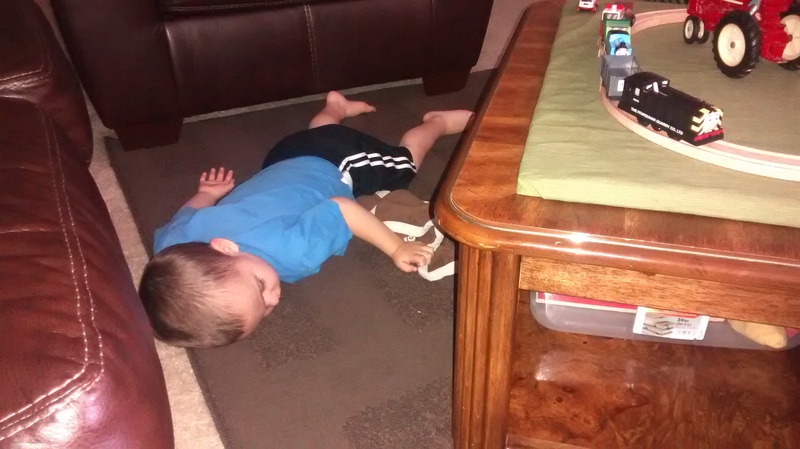 What Joseph’s Been Up To: Joseph’s been sleeping a lot, trying to get over his illness. There was one day that he fell asleep late in the afternoon and seemed content to stay asleep, so I let him. I just woke him up long enough to give him his medicine, get him into his pajamas, and put him in his bed. He woke up about midnight (so at that point he’d had about eight hours of sleep) and didn’t want to go back to sleep. 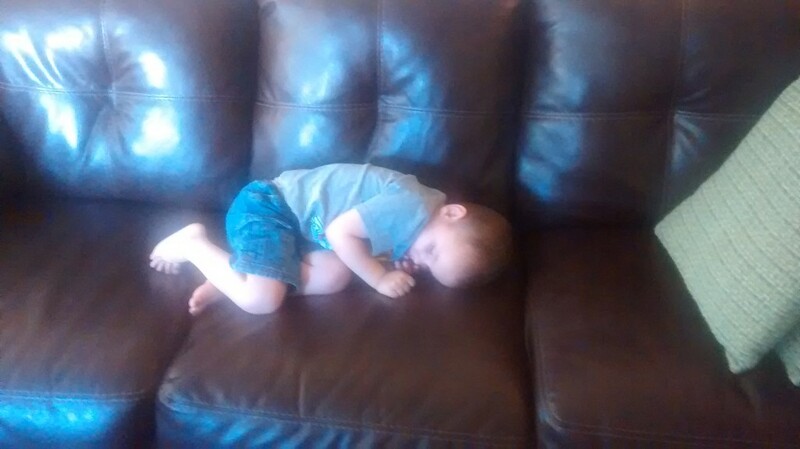 After a couple hours (including times that he’d call out, “Momma, wake up!” because he knew I could hear him via the baby monitor) he finally gave in and fell back to sleep, but was back awake at 7:00. Paul and I were a bit zombie-ish the next day. After Paul got back from cleaning the church, Joseph asked him if he’d had fun. Paul had to explain to him that it wasn’t like when he (Joseph) went to church (which is mostly monopolized by nursery, so playing with toys, singing songs, and getting a snack), so no, he didn’t have fun (but we did explain that it was important to keep the church clean, so it was good that he cleaned it). 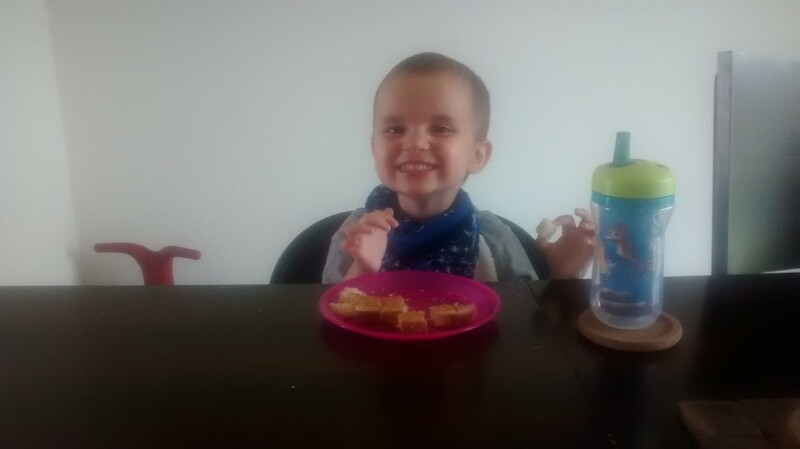 Finally, throughout the week, Joseph has been asking at different points if we were going to see Grandma and Grandpa and Uncle Jason. I think that he thought that since we had gone to the beach, it meant that we were going to get to see them (considering the fact that the only time he’s been to the beach before was in California). I’ve said that we’re going to see them at Christmas, but he can’t quite wrap his brain around that concept. Sleeping where he’s probably most comfortable. He didn’t want me to put him in his bed. Some friends of ours gave us this pop-up soccer goal (it didn’t meet their needs). 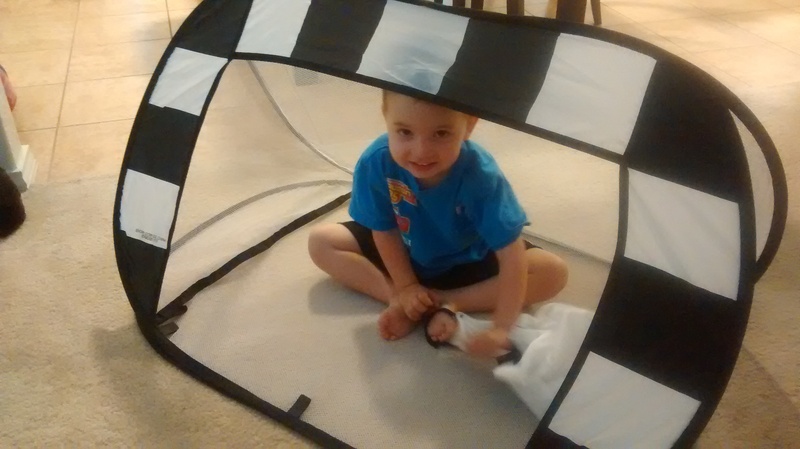 Joseph has deemed it his “tent”. I had to feed him his breakfast in it this morning.